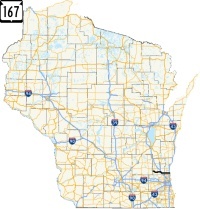 Quickie Summary: State “Trunk” Highway 167 is a key route across the northern suburbs of Milwaukee. 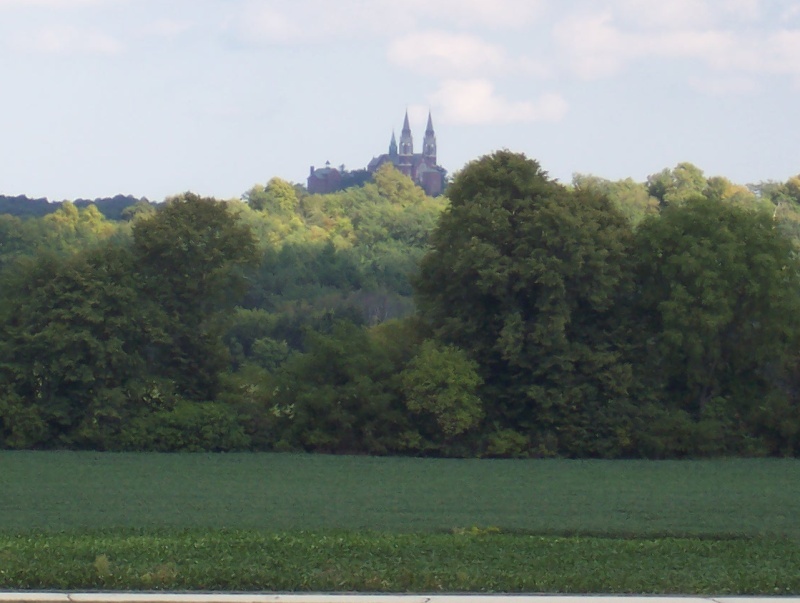 It provides access to the beautiful Holy Hill area, as well as the booming towns of Germantown and Mequon. The eastern part is mostly suburbia; the westernmost 10 miles or so provides a hilly, scenic drive. The Drive (East to West): Highway 167 runs along Mequon Road through – surprise! – Mequon. It begins at the I-43/Highway 32 interchange and Highway 57 joins 167 for the first few miles going west. The first intersection is just a few hundred feet west, known as Port Washington Road, which was the main highway north before the interstate was built. If you’re up for shopping, you’re in the right place. Mequon (pop. 23,820) is consistently rated as one of the “Best Places to Live in the United States” by Money Magazine – and there’s a lot of money in Mequon. The city has a lot of high-end homes, some plotted on acre-plus lots and others amidst forested neighborhoods. Mequon is often paired with Thiensville (pop. 3,254), known locally by some as the “worthwhile square mile.” Mequon is Wisconsin’s fourth largest city by area, while Thiensville is about 1/36th of Mequon’s size. Nestled right along the Milwaukee River, Thiensville features the charming and compact layout of a small Midwestern village, while Mequon is a more spread-out version of a nice suburb. Heading west along Highway 167 is basically our typical nice suburban landscape for a while. You cross the Milwaukee River and reach Green Bay Road, where Highway 57 heads south into Milwaukee; Green Bay Road itself continues north into the aforementioned Thiensville, where more small-town charm awaits (the even more charming Cedarburg is a little further up as well.) Continuing west on Highway 167 gets you to more open areas; the built-up parts of Mequon go away past Highway 181 (aka Wauwatosa Road or 76th Street) and you’re in the two-lane countryside for a short time before hitting Washington County. Yeah, that was quick: Ozaukee County is only six miles wide at that point. Washington County means entry into Germantown (pop. 20,100). Much of Germantown is newer, developing city but it retains history in a downtown area that began as the settlement of Dheinsville in 1842. Much of the historic museums, including Wisconsin’s largest bell collection, reside just up Highway 145, which Highway 167 crosses shortly after entering Germantown. Still known as Mequon Road at this point, Highway 167 serves somewhat as the “new” type of Main Street USA, where Germantown’s main retail and commercial centers line the road for a few miles and decorative street lights tell you this area is given close attention. Germantown doesn’t look at Mequon with too much envy; in July 2007 Germantown was rated as the 30th most appealing city, town or village in the United States to live in by Money magazine. Basically, if you live near Highway 167, you’re in a desirable area. Toward Germantown’s western edge, Highway 167 becomes a freeway for a short spell, joining U.S. 41/45 for a ride northwest to Holy Hill Road, which Highway 167 joins going westward. Following Holy Hill Road EAST at the interchange, by the way, is another good way to access Germantown’s old downtown, the Dheinsville Historic District, and the little museums. You can also stop in Jerry’s Old Towne Tavern and karaoke if you have the courage. By the way, following I-41/U.S. 45 north another mile or so brings you to Cabela’s, the outdoor shopper’s paradise. You can see it from the Highway 167 overpass, and if you need a compass to help with your State Trunk Tour trips, well, I’m pretty sure they’ll have some available. West from the freeway, Highway 167 enters Richfield and crosses Highway 175, the original U.S. 41. 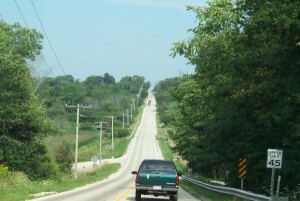 This stretch of Highway 167 begins to take on the hilly character of the Kettle Moraine region it enters. Small taverns dot the roadside, including the charm of the Down Slope Pub… one step inside and you feel like you’re in old-school Ireland (After the Germanic nature of Germantown, this area gets awfully Irish – after the town of Richfield is the town of Erin, after all. After crossing Highway 164, the twin steeples of the road’s namesake begins to come into view. They’re the unmistakeable symbol of the Holy Hill National Shrine. 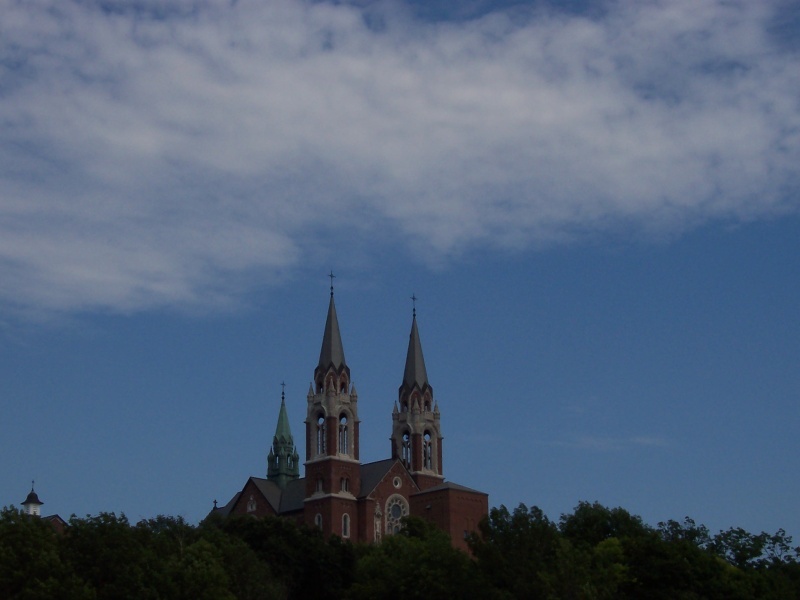 The highest point in southeastern Wisconsin (1,350 feet above sea level, or about 770 feet higher than Lake Michigan), Holy Hill was declared a Shrine of Mary, Help of Christians in 1903 and in 2006 was elevated to the status of Minor Basilica. It also hosts events such as the annual Saints & Sinners Golf Outing…no word on which sides get the better scores, since some golfers would sell their soul for a good golf game. There probably aren’t the usual number of references to “Caddyshack” in this outing either, but who knows? Highway 167 narrows and traverses hills near Freiss Lake approaching Holy Hill. The twin steeples atop Holy Hill dominate the landscape for miles around and will keep you staring… and wanting to climb up in there and check it out. Downtown Milwaukee – 35 miles away – is visible from these steeples on a clear day. Highway 167 as Holy Hill Road twists and turns more as you approach the entrance to Holy Hill in a stretch of road more commonly found in the Driftless Area of southwestern Wisconsin. The entrance is on the south side of the highway… watch for slow traffic sometimes as a result. More scenery can be found along Highway K, which doubles as a Rustic Road here in the Town of Erin. You’ll also have an access point to the Ice Age National Scenic Trail. Less than two miles later, Highway 167 comes to an end. The increasingly busy Highway 83 is where you reach the end of the brief 167 tour, but you can follow 83 north to Hartford or south into Waukesha County’s Lake County for more cool stuff to see. Or, continue west on County O… you’ll eventually reach Highway 67! 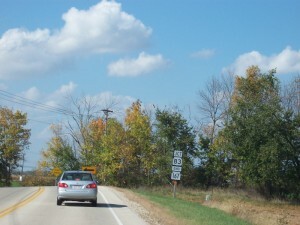 Highway 167 comes to an end at Highway 83, which continues to traverse the Kettle Moraine area and heads south into Lake County in Waukesha County. While not officially a “child” of Highway 67, you can reach 67 by continuing westward on County O, which after a bit of zigzagging through the hills in these parts will bring you there. Highway 167 overall is a nice, quick tour – about 25 miles through pleasant countryside, nice suburban areas and past a National Shrine. Combine it with Highway 83, 67 or 164 for a longer trip to see more. Enjoy!